Glas built his first and last true sports car in 1965. It was the 1700 GT with a 1,682 cc engine of 105 bhp. This engine was also available in 1964 in a saloon. Glas intended to take on the likes of BMW and Mercedes. For these markets he got Frua to design a Glas car for a V-8 engine. This engine was created by joining cylinder blocks from two 1,300 cc engines. The 2,580 cc engine produced 150 bhp, which was sufficient for 125 mph (200 kph). The Glas company was always successful with small cars and hundreds of thousands of them were sold but when Glas's ambitions took him into new territory business went down hill. 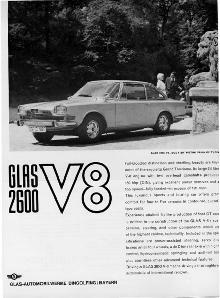 In 1966 Hans Glas was forced to sell his company to BMW for 10,000,000 Deutschmarks. BMW continued to make the 1700 GT and the V-8 until 1968 except with BMW engines. Hans Glas died aged 79 on 14 December 1969.